Angela, mom to our former fosters, Kirby and Freddie Jean Medley (now Eric and Eleanor) , sent us this little update. On the left, a picture of the wee ones when the first moved in with Angela and Paul. 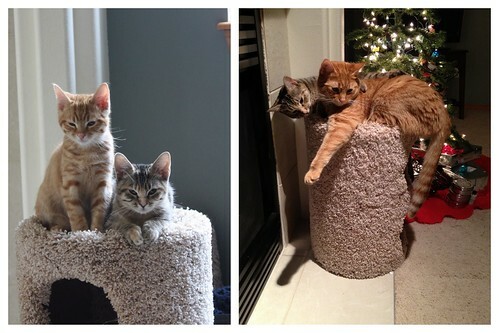 On the right, same kitties, same tower, months later. Just wanted to swing by and give you a super quick update and a picture. Eric and Eleanor love the Christmas tree...a little too much. They are growing fast, love to carry things in their mouth all around their house (including a package of via coffee that mysteriously disappeared from the kitchen), and they love to play chase. They still think they can fit on their tower together but as you can see by the picture they look ridiculous! Haha. Thanks so much for the update, Angela! It's so good to see these happy, healthy kittens again! Awww... Thanks for the update. Kittens grow up so quickly! More importantly though, does Eleanor still clean Eric's ears? I do love how rich their coloring has become! They look wonderful and it's great to see that they are obviously LOVED! we thinks they may need to upgrade that cat condo....adorable update!! Hooray for an update! And an update of two of my favorite kittens to boot!I'm so glad to hear that Eleanor and Eric are thriving. Thank you Angela! I have a cat named Eleanor! Look how plush their coats have gotten. What fine grownup kitties! There is a definite need for a larger condo cause the babies have grown. And Kirby's (aka Eric) coloring is fantastic. Great update - awesome to hear they are doing so well and are clearly a treasured part of the family. Eleanor definitely still loves nomming on Eric's ears. Here is a video I just took yesterday. Oh good gravy, Angela. I just had to transfer the link to my phone to watch it, but SO worth it. Adorbs. Oh my, Angela! Thank you so much for the video. Anytime I look back through Eleanor's and Eric's kitten pictures, "again with the ears" is the tagline I most associate with them. So happy to hear that it's continuing in their lives with you and Paul.